DOES THE BEACH ever get old? Nope. But even if you’re looking for something more than pristine Gulf waters, streaming sunshine, and soft white sand, you needn’t venture far from The Beaches of Fort Myers & Sanibel. A short drive inland, and in some cases a short ride along the same beach-trimmed islands, brings you to a whole different side of the outdoors — swamp boardwalks and cypress trees, alligators and osprey, all within easy reach. The beach may never get old, but neither does the rest of Mother Nature. Right off the eastern shore of Captiva Island rests the two-mile-long Buck Key Preserve. And to locals, the words “Buck Key” tend to mean one thing: kayaking. The preserve is one tunnel of mangrove forests after another, the calm, narrow backwaters interrupted by a solitary lagoon before hitting more open, wilder terrain. Brown pelicans, manatees, and otters may cross your path at any given moment, so keep those eyes wide. Less avid paddlers will want to stay closer to Buck Key Preserve, following the main north-south stretch parallel to Captiva Drive. But if you’ve got the gear, the time, and the wherewithal, the Buck Key Paddle Trail takes you all the way out to Pine Island Sound, where dolphins, osprey, and egrets break the silence, and the waves keep your heart pumping. It’s easy enough to spend all day out on these waters — especially if you’ve packed a hearty picnic. But when your arms inevitably get achy, head back to Captiva, aiming north for South Seas Island Resort. They’re right on the tip of the island, and they have all the gear you need (not to mention the high-thread-count sheets). Kayaks, parasails, stand-up paddleboards, jet skis — they’ve also partnered with Sanibel Sea School to help familiarize visitors with the ocean. After all, you probably know surf and sand, but how skilled is your hand at some of the best shelling in the world? Smack in the middle of Fort Myers, the Six Mile Cypress Slough (pronounced “slew”) is a 3,400-acre strip of wetlands that serves as a so-called “linear ecosystem.” Think of the slough as a 9-mile-long, 1/3-mile-wide sliver of tranquility. The slough is a means of north-south travel for panthers and bears, as well as a home for a variety of plants and animals, from the elusive ghost orchid to wading birds. More than a mile of boardwalks will give you a taste of the preserve, connecting the aptly named Gator Lake to smaller bodies of water via wetlands lined by sawgrass and cattails. More adventurous wanderers can reserve a spot on one of the preserve’s summer wet walks, which take hikers off the boardwalk and into the slough itself. You’ll need balance, along with long pants and shoes that tie up tight. A good bit of courage — the water can be shoulder-high after heavy rains — doesn’t hurt, either. Not feeling it? You can always check out award-winning local photos of the preserve from the air-conditioned comforts of the onsite interpretive center, where exhibits, interactive displays, and a gift shop can help you create memories of this natural wonder while staying high and dry. Just north of Sanibel Island’s Gulf beaches, you’ll find a tangle of mangroves and waterways. You can hike, bike, paddle, or simply drive your way through some of the 7,600-acre J.N. “Ding” Darling National Wildlife Refuge, teeming with native wildlife throughout the year. We’re talking 60+ varieties of reptiles, 245 species of birds, and 35 types of mammals. 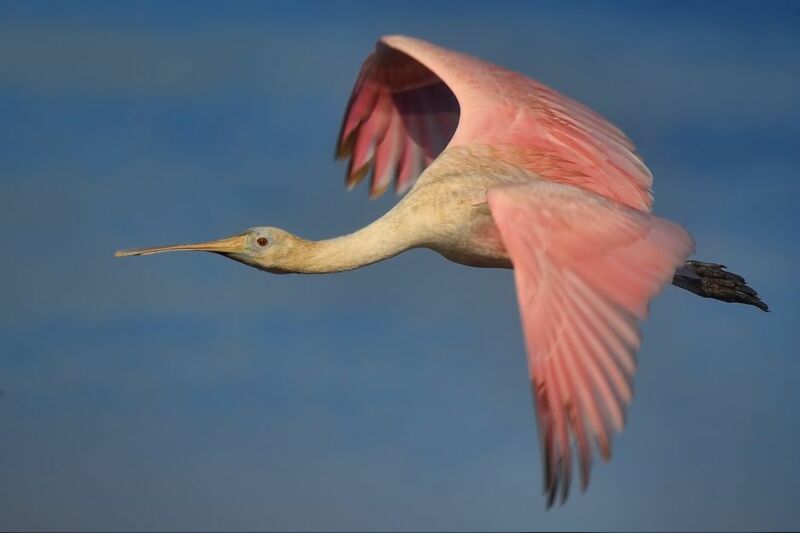 The daily spotting lineup may include alligators, blush-pink roseate spoonbills, and even a manatee or two, if you’re lucky. If you’ve met your hiking and biking quota, take a scenic cruise along Wildlife Drive from the convenience of your car. Otherwise, climb the observation tower along the way for sweeping views of this estuary and the vast back bay beyond (you may even spot the high-rise condos of downtown Fort Myers if you squint just so). With so much stunning terrain to cover, a stay at The Inns of Sanibel Beach & Golf Resorts is in order. This collection of four Gulf-front properties on Sanibel Island is the perfect place to recharge after a long day of paddling through “Ding” Darling’s mazes of mangroves. You’ll get the best of both worlds, on both sides of Sanibel. Years ago, this cluster of four barrier islands south of Fort Myers Beach was only accessible by boat, making it the perfect spot for some secluded alone time — hence the name. Nowadays, a series of boardwalks and a very convenient tram make this still-remote-feeling paradise a place that combines the best of the beach with all the wonders Florida’s estuary ecosystems can heave your way. 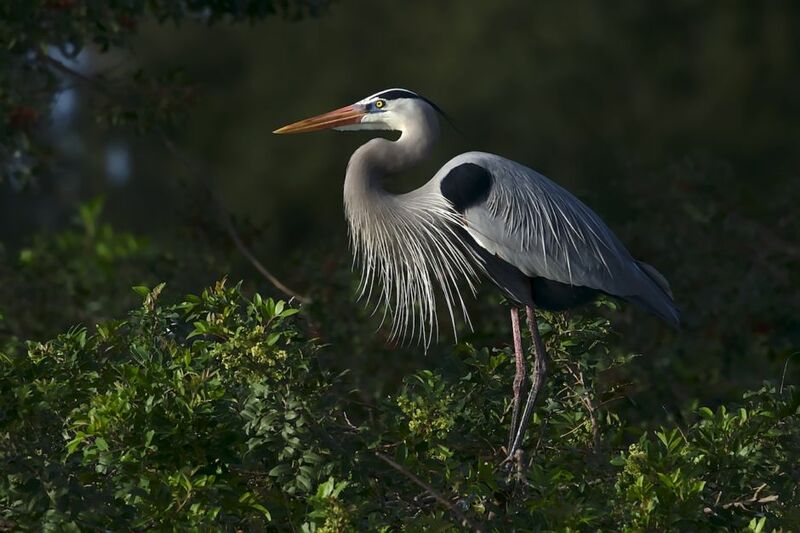 To make the most of your visit, skip the tram and walk the boardwalks for great bird-watching and the chance to spy a manatee, marsh rabbit, or bottlenose dolphin. Onsite stores offer kayaks, canoes, paddleboards, and bikes to rent. Bike your way to Black Island, where five more miles of multi-use trails allow you to further explore the natural setting. By now you might be exhausted, so make the quick drive to the north end of Estero Island, where the folks at Pink Shell Beach Resort and Marina will be happy to help you relax with a series of pools, award-winning dining options, and views of the beach that require no work whatsoever. 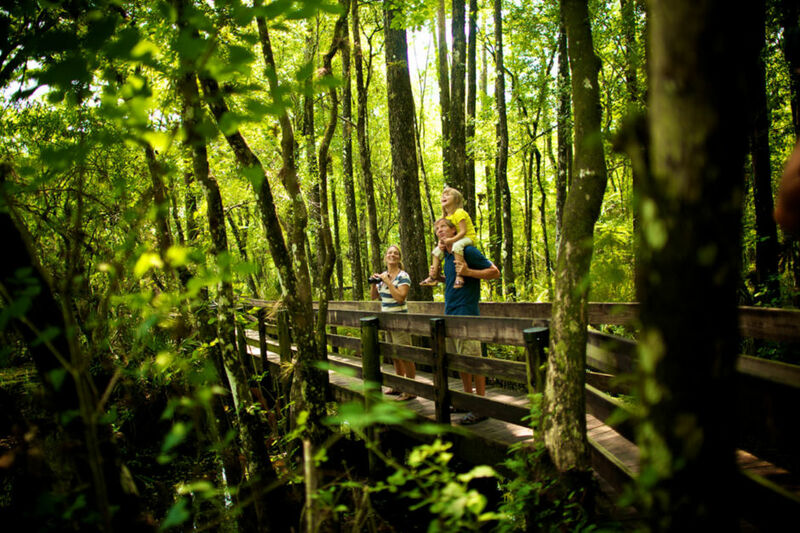 A 2 ¼-mile boardwalk in Audubon Corkscrew Swamp Sanctuary takes you through a variety of Florida ecosystems: pine flatwoods, marshlands, wet prairies, and one of the largest old-growth bald cypress forests on this continent. “These impressive trees, relatives of the redwood, tower 130 feet into the sky and have a girth of 25 feet,” the sanctuary’s website explains. “Their massive branches are draped with mosses, lichens, bromeliads, and ferns.” It’s like a forest party to which everyone’s invited. Otters, alligators, and white-tailed deer also call Corkscrew home, as does the largest ghost orchid ever discovered. The Corkscrew “Super” Ghost Orchid was first spotted in 2007 (it usually starts blooming in June or July each year). It’s the multitude and abundance of blooms that make this particular specimen so unique (the plant gets its spooky name from its lack of leaves and from the slender, snow-white flowers that sprout so elegantly from the bare tree trunks). Corkscrew’s “Super” Ghost has sprouted more than a half-dozen flowers at one time. In 2014, it produced 40+ blooms throughout the year. 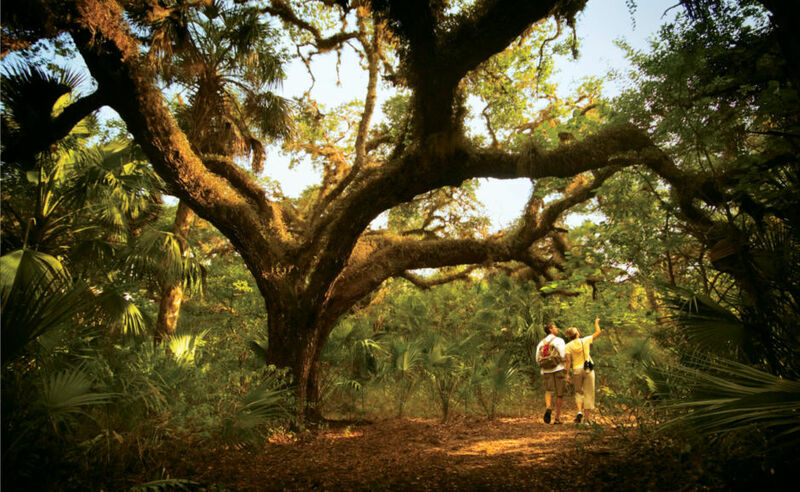 Hiking, biking, paddling, horseback riding, camping — this 768-acre park has a little something going on for every weekend outdoorsperson, including one of the most thrilling and extensive mountain bike (mountain-ish, you could say) trails in all of Florida. Then there’s the water. 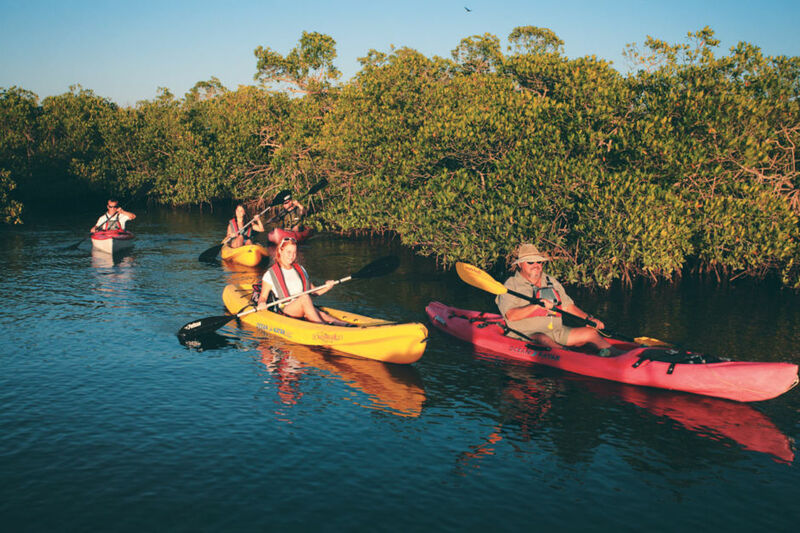 Kayak rentals allow you to set out on the glassy Caloosahatchee River, which connects Lake Okeechobee to the Gulf of Mexico (running right through Fort Myers on the way), and is home to manatees and mangroves aplenty. It’s thought that Calusa Indians first settled here, followed by the Seminole and the early inhabitants of nearby Alva. These days, the park is home to two archaeological sites, as well as some of the best-kept equestrian trails in Southwest Florida. You’ll also find a fishing pier, hiking trails reserved for pedestrians, and primitive campgrounds for those looking to stay the night.